If you travel during the shoulder seasons, or in winter, you\'ll enjoy quieter streets. We are comparing Venice Walking Tour and Gondola Ride Combo Prices from leading ticket suppliers and Try to find you Cheap tickets prices on the market. Beautiful, iconic, romantic Venice hardly needs an introduction with its Grand Canal, the Basilica della Salute, and St Mark\'s Basilica. As your guide shows you around Venice, you\'ll learn all about the Republic of Venice and its history. Wander the narrow streets of the Mercerie where once upon a time, expensive and exotic goods from distant lands were sold. See the Rialto Market, admire the ornate Byzantine façade of St. Mark’s Basilica, learn about the explorer Mark Polo and see where he once lived, all this and more as you see Venice both from a tourist\'s perspective and a locals. The perfect combination of walking plus gondola in order to see and understand Venice from its streets and its canals. The perfect introduction to Venice for first time visitors. A tour that\'s full of fact, legends and info that the guide book wouldn\'t tell you! Great for people who enjoy guided tours. You must be comfortable with walking for 1.5-2 hours. Your Experience With Venice Walking Tour and Gondola Ride Combo? Meet your friendly, knowledgeable, English speaking guide who is a local and knows Venice like the back of his hand at the meeting point in St Mark\'s Square and get acquainted with the other members of your group. Your guide will first lead you around the huge St Mark\'s piazza giving you details about the Doge\'s Palace,St. Mark’s Basilica , the astronomical clock, and everything else that makes up the famous St Mark\'s Square. You\'ll then make your way to Campo Santa Maria Formosa to admire one of Venice\'s most beautiful churches before moving on to see the outside of Marco Polo\'s former home, the Malibran Theatre, and the narrow shopping streets of Mercerie where you\'ll have the chance to stop for a quick coffee. You\'ll also see the area of Rialto with its market and of course, the iconic Rialto bridge along with many more famous sites plus hidden areas that tourists usually miss. The walking tour ends at the gondola dock where your guide bids you goodbye whilst you embark on a 30 minute ride on the Grand Canal and along the smaller canals in the Fenice area in the capable hands of your gondolier who will deliver you back to St Mark\'s Square. What Venice Walking Tour and Gondola Ride Combo Includes? Walking tour with English speaking guide. 30 minute shared unguided gondola ride. Don\'t expect to learn much from the gondola ride – It\'s unguided. 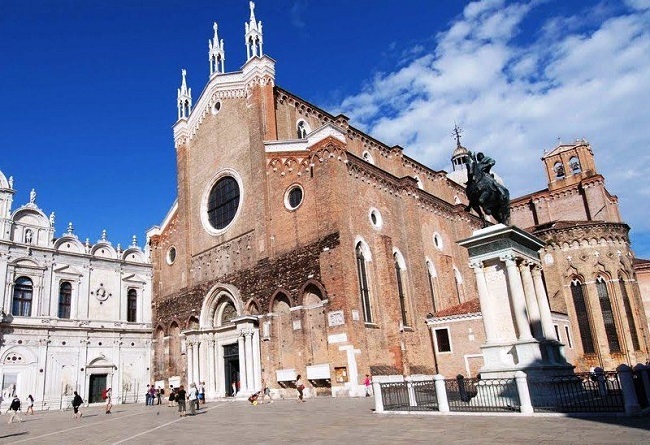 Don\'t expect to see all of the top touristic sites in Venice – You can see those later yourself. Travelers Reviews about Venice Walking Tour and Gondola Ride Combo? Travellers talking about this walking tour and gondola ride combo on GetYourGuide, Viator, and TripAdvisor give it very good reviews and high ratings. Everyone agrees that the local tour guides are what make this tour special as they share their knowledge and passion of this beautiful city, even going so far as to recommend where you should eat, where you should go, and what you should see on the rest of your trip in Venice – Always good to get insights from an insider! People acknowledge that the gondola ride at the end is a bit of a touristy gimmick but that it\'s a must-do anyway! In terms of slightly negative reviews, some people got unlucky with a guide who was having an off day, saying that they found the tour boring because it lacked passion – The guide just reciting facts. This seems to be a rare occurrence though with most people saying only positive things about the guide. Others warn that there is not much time to stop for photos – You\'ll need to revisit the places for that, and also not every top landmark is covered – The walking tour is an overview of some of Venice, not all of it. Some people were also unaware that the gondola ride was unguided and were unhappy because their gondola did not tell them about the sights they were passing. Check the weather to see if you need an umbrella or sunscreen.